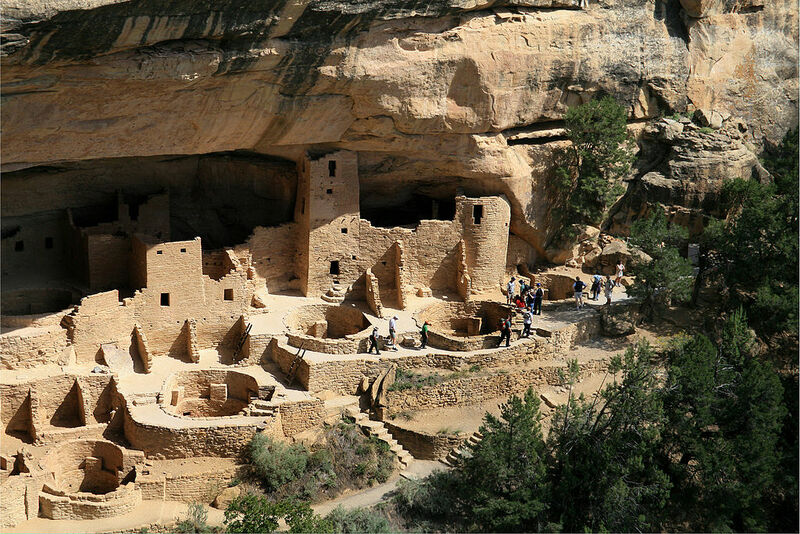 Mesa Verde is not only a U.S. National Park but also a UNESCO World Heritage Site. It is a collection of more than 4,000 archaeological sites and 600 cliff dwellings in Colorado, spread across a beautiful landscape of sandstone canyons lying between the Ute Reservation desert and the Rocky Mountains. Mesa Verde was home to the Anasazi from 600 to 1300 C.E. By 600 C.E. there were many villages and dwellings scattered around the canyon area inhabited by small groups of subsistence farmers who were drawn by the fertile soil. From about 1100 C.E., the Anasazi began to build more concentrated population centers primarily in caves and under large rock overhangs along the cliffs. The homes and kivas (rooms used for religious or spiritual ceremonies) were built out of adobe and designed to use natural solar energy. Their location in the cliffs also made the dwellings easily defensible. One of the reasons the Anasazi moved into the cliff dwellings was to create irrigation channels capturing water running down the cliffs because of the increased incidents of droughts. Archaeologists believe that the droughts, combined with population growth made it difficult to sustain life in the area. The Anasazi began to move south to present day Arizona and the Mesa Verde region was nearly empty by 1300 C.E. Mexican-Spanish missionaries and explorers traveled through the area in the 17th Century, but were not in the right place to see the cliff dwellings. In the 19th Century, the Ute tribe wintered in the canyons of the Mesa Verde, but did not inhabit the buildings left by the Anasazi. A prospector named John Moss came upon the dwellings in 1873, then brought photographer William Henry Jackson back with him the next year. Through his work, the area became known to the wider world and researchers began to seek it out. Virginia McClurg, a journalist for the New York Daily Graphic, visited in 1883 and 1887, then worked diligently to fight for protection of the region (which was being looted by explorers and adventurers) until it was named a National Park in 1906. Cliff Palace - This is the largest cliff dwelling in North America and it is thought that it was probably the social and administrative center for the area. Spruce Tree House - More than a house, this complex of dwellings in a rock alcove is thought to have been home to 60-80 people. Balcony House - Although this was only a medium sized dwelling, it is very well preserved and has a tunnel passages and a ladder that make it an adventure. Wetherill Mesa - Here you will find a walking trail, reachable by tram, that passes several beautiful lookout points and leads to the Badger House Community, where you can see a good example of a pit house (a semi-subterranean dwelling). Ute Mountain Tribal Park - This park, which borders Mesa Verde National Park, encompasses much of the land that was home to the Ute tribe, with dwellings, petroglyphs and wall paintings. Four Corners - There is a monument at the meeting point of four states, Colorado, Arizona, New Mexico and Utah, which also marks the boundary of the Navajo Nation and the Ute Tribal Reservation, and therefore is a site of great significance for the Southwest region as a whole.